Attending the Miami Film Festival is always a treat for us. We’re now in the third or fourth year of making this a “spring break” activity. The weather is always (at least) 30 degrees warmer than Washington and good friends host us. We see movies, we dissect them, we eat, we laugh, we sleep, and the next day we do it all over again, for three or four days. I should also note that we even “train” for our typical three films a day: long morning walks on Miami Beach or through beautiful residential neighborhoods. Sustenance involves everything from the best ice cream in Miami, the unbelievably delicious frita cubana to be had in Little Havana, a return visit to our most favorite Miami restaurant (River Seafood Oyster Bar), and our first but not last visit to Michael Schwartz’s new, wonderful Amara at Paraiso. The Miami Film Festival (#MiamiFF) focuses on offering a great array of Latin American and Miami-made movies, and this year they clearly have made an effort to increase diversity in film directors and to expand to films that would appeal to a younger audience. There are over 150 (168 or 195, depending upon which of our memories is more accurate) screenings shown over 10 days, and choosing the films is not easy. This year we found more of a variation in the films we saw than in previous years. (In total we saw nine films in three and a half days.) A few I will rate with five stars — by my standards a ‘you must see this one.’ Others, including some that were widely heralded, just didn’t work for us. And of course, there were a number in between those poles: films that were great (generally because of the subject) but fundamentally flawed in the execution. I’ll start with the best of what we saw. 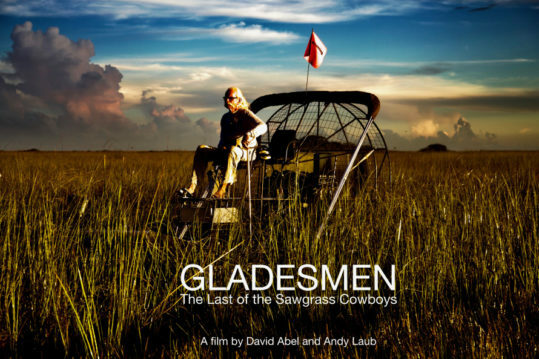 This film is a superb documentary that tells the story of Florida’s Everglades airboaters –- the men and women who for generations have lived, fished and hunted freely in one of the most environmentally threatened – and beautiful — areas of the US. The film is populated with these wonderful characters (a number of whom were in the audience) along with environmentalists and water engineers who also make their case eloquently. It presents both sides of the contentious issues that arise in trying to find the right balance in the area to protect it as a water source for millions of Floridians and preserve a way of life for a small group of people. The filming is elegant, the scenery magnificent, and the complex story simply told. I wound up cheering for everyone.